Get the Full StoryMcDonald's is now in the doughnut-making business, and Dunkin' Donuts might have some competition. From sweet potato fries in Australia to cheesy potato bites and Instagram-worthy McFloats in Japan, McDonald's has pioneered treats for fast-food-lovers worldwide. 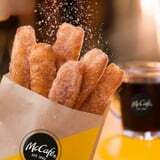 Now, the fast-food giant is sending some love to its United States fans with new cinnamon sugar McCaf Donut Sticks. These indulgent churro-style treats will be available on the McDonald's breakfast menu starting Feb. 20 for a limited time, because the world can only handle so much fried, doughy goodness. The crispy doughnuts will be made fresh each morning at participating McDonald's locations and sold by the dozen and half-dozen. McDonald's customers can even get a special discount when pairing a half-dozen Donut Sticks with a small McCaf brewed coffee for only 1.99, similar to Dunkin' Donuts' 2 deal. So for anyone who's already a fan of the restaurant's bakery items - like McDonald's morning coffee cakes and muffin toppers - cinnamon sugar doughnuts are really the only logical step forward, right? McDonald's originally began testing the Donut Sticks in early 2018 and again in October 2018 in select Illinois restaurants. Now, the long-rumored sweet treats are officially available nationwide for all McDonald's fans to enjoy. So get 'em while they're hot!